The two-year contract of Nigeria’s head coach, Gernot Rohr, has been extended by default, following the country’s qualification for the 2018 World Cup. Rohr signed a two-year deal with the option of another two years, if Nigeria qualifies for the World Cup in Russia, a feat they achieved over the weekend after their 1-0 win over Zambia. The German would have been fired, if he failed to lead the former African champions to the tournment, according to the terms of the contract. Since taking over as coach of the Super Eagles, Rohr has lost only one game – the 0-2 loss to South Africa in Uyo in the AFCON 2019 qualifiers. His overall record shows he has won has won five matches and drawn one. 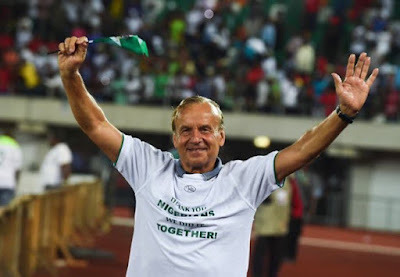 An official announcement by the Nigeria Football Federation (NFF) is expected to come soon, with Rohr’s current deal set to expire after the 2018 World Cup.